With mainsail up she can cruise on 1 motor burning 1 l / Hour. 12 volt, 3 batteries charged by: engine, solar panels 3 x Solar Panels ( 300 W ) 2 fixed and 1 movable. Strip planked Kiri with West Systems Epoxy below the waterline and Gabon Marine Ply & West Systems Epoxy above. Dagger boards and kick up rudders. 2 x Honda 12 l fuel tanks plus 5 x 20 l Jerry cans give total capacity of 124 l of Gasoline. Water is carried in Jerry cans. Fridge is a Waeco 12 v portable type. Probably not for those looking for a production nautical caravan, this Pod Cat has just been sailed up from Australia. She is a fast, simple cat is built from quality materials. Her simple systems mean more sailing and less fixing, and the 15 :1 ratio hulls combined with low weight means fast passage times, a smaller sister ship held Darwin to Ambon record for 20 years . She need a little tidying up, but is ready to sail and is offered at a sensible price, with plenty of new equipment. Easily sailed short handed and lightly used, her draft of only 0.4m, with the dagger boards up, means she can go where most other sailing vessels can't. She was always stored under cover for 6 months of the year in when in Australia. The owner who now finds himself unable to sail her will listen to all reasonable offers. 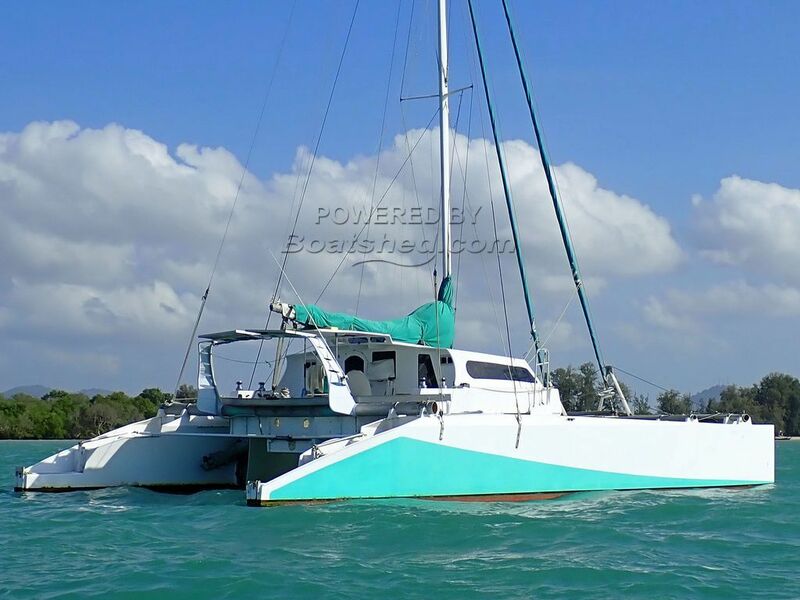 This Custom 13.5 M Fast Cruising Pod Cat has been personally photographed and viewed by Alan Giles of Boatshed Phuket. Click here for contact details.